Epsilon-8100 is a managed Layer 2+ Ethernet switch module offering eight 10/100/1000Mbps copper twisted pair ports in the compact PC/104 form factor. Epsilon-8100 is designed for rugged applications including industrial, on-vehicle and military. Epsilon-8100 is a standalone switch that does not require any host computer interface. All switch functions are managed by a 416MHz MIPS processor embedded directly into the switch. The processor is accessed via an in-band web interface over one of the Ethernet ports or via an out-of-band command-line interface over an RS-232 serial port. The integrated web interface provides an intuitive GUI for use in configuring and managing all switch functionality. On-board memory holds dual application images, boot code, MAC addresses, and other parameters, and can also be used for program execution. Epsilon-8100's advanced Ethernet switch board includes two innovative features that enable automatic power savings. The switch can detect unused Ethernet ports on network devices and power them down or place them in stand-by mode. Additionally, the switch actively adjusts the power level needed based on cable length, saving energy on links shorter than the 100m maximum specified length. Input power is provided through the built-in, wide-range +5 to +36VDC power supply, enabling operation using industrial power sources. Epsilon-8100 was designed for use in vehicle and harsh environment applications. All I/O connectors are latching, providing enhanced reliability over the RJ-45 connectors used in commercial Ethernet switches. A 50% thicker PCB provides better protection against vibration in vehicle environments. The wide range 5-36V input power supply is compatible with all common vehicle and industrial power sources. The -40ºC to +85ºC operating range makes Epsilon-8100 suitable for use in outdoor and vehicle applications. Epsilon-8100 comes loaded with all required firmware, enabling its immediate operation without any development effort. The included web interface provides an intuitive GUI for use in configuring and managing switch functionality. 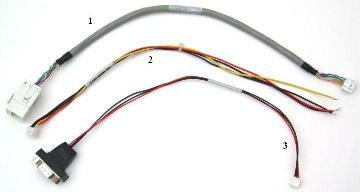 The Epsilon-8100 cable kit, C-EPS8000-KIT, includes cables for Epsilon-8100's input and output.